Hours for the Medina and Rocky River stores are unchanged (still open until 8:00pm Mon-Thu). The Peninsula store will remain open until 8:00pm during the evenings of our Bicycling and Maintenance Clinics. We wish all of our customers, friends, staff, and their families a Happy and Prosperous New Year! Come out of hibernation and help us celebrate Northeast Ohio's winter season at Winterriffic, an all-new Cleveland Metroparks event! Century Cycles will be on hand, displaying winter cycling clothing and doing demos of the Surly Pugsley snow bike (above) at 1pm and 3:30pm. Other winter activities will be featured throughout the day, including dog sled demos and snowshoe rentals, plus the chalet's tobagganing chutes will be in operation. Come join us for a winterrific time! The History Channel's producers, who created the show American Pickers, are making a new show named Top Pickers. This new show will feature Picker Teams who will compete for the best pics, ultimately earning the title of Top Pickers and a big cash prize! For this run of the show they are interested in finding a team of cyclists who are also interested in picking. They are searching specifically for bicyclists who are energetic, knowledgeable, and passionate about collecting. Picking Teams should be able to spot hidden treasures, know how to flip items for profit and pick better than anyone they know. Interested candidates can apply by e-mailing mailto:pickercasting@cineflix.com? ASAP with a description of you and your picking partner, your area(s) of expertise, your contact information, and a recent photo. Century Cycles is closed today. We re-open tomorrow at 10am -- with everything still on Holiday Sale! With just a few more shopping HOURS left until the big day, here are some last-minute gift ideas for everyone on your list! 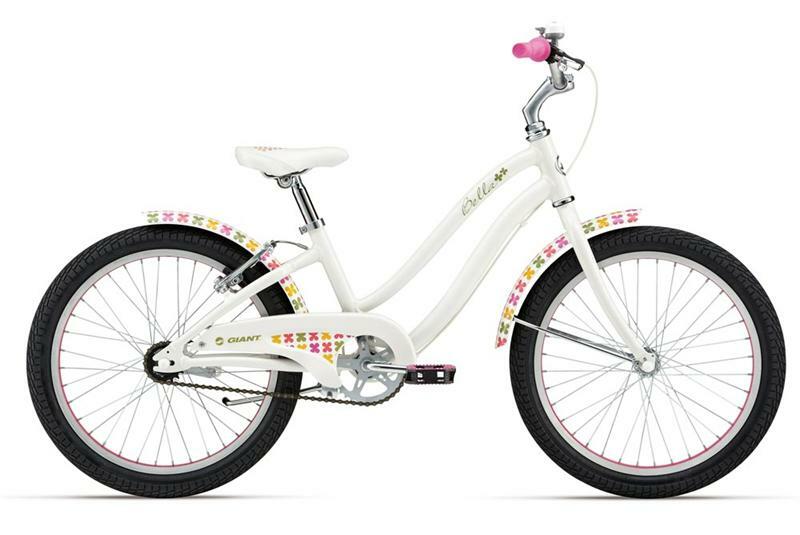 For Kids: Raleigh Lil' Push balance bike, Giant Bella girl's bicycle (pictured above), Giro Bravo Jr. cycling gloves for boys or girls. For the cyclist who has everything: A Century Cycles Gift Card, or maybe even a unicycle? Century Cycles is open until 5pm today, 10-3pm tomorrow (Christmas Eve), and we are closed on Christmas Day. Our Holiday Sale runs through December 31 for your shopping convenience, with 10% off all bicycles (including those already on sale!) and 20% off everything else (clothing, lights, trainers, accessories and parts). Plus remember the current Hot Deal -- three great light options that ALL make for great stocking stuffers, only available until Wednesday or while supplies last! What type of pedals are right for me? Your body comes into contact with your bicycle in three areas: Your seat, your hands, and your feet. To get the most enjoyment and benefit out of your cycling, you need to carefully choose the parts for each of these areas. Your feet are where choosing the right pedals makes a difference, and there is not one choice that works best for everyone. Here's a rundown of the difference types of pedals, and the advantages and disadvantages of each. These are the basic "regular" pedals that just have a flat surface to place your feet on. They come in many shapes, styles, and materials. They range in price from around $10 for plastic ones to $20 for metal ones. In either case, they are cheap versions that you just replace if and when they wear out or break. For people who like the best of the best in their parts, however, there are high-end platform pedals available in the range of $50 to $100 and even more that are made of lightweight alloys and have servicable and replaceable high-quality ball bearings. Most hybrid and cruiser bikes come with "comfort platform" pedals, which have a smooth surface that makes them usable with thin-soled sneakers, sandals, or even barefoot (in true "beach cruiser" fashion). Most kids' bikes and low- to mid-level mountain bikes come with "mountain platform" pedals. which have a somewhat "spiked" surface to help grip the bottoms of your shoes better to avoid having your feet slip off the pedals. This idea is taken a step further with BMX-specific pedals, which usually have plastic or metal studs located across the pedal surface that "bite" into the tread of your shoes to prevent slippage. Pros: Inexpensive (usually), work with any kind of shoes. 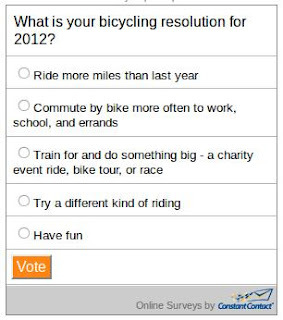 Cons: Less efficient--promotes "pedaling in squares" rather than pedaling in circles. These are a regular mountain-style platform pedal with a plastic or metal toe clip or "cage" attached. Usually, there is also an adjustable strap around the pedal and toe clip, but some people prefer to use only the toe clip without the strap. This setup is a little more efficient than plain platform pedals, because it allows you to exert a somewhat more even effort throughout the full rotation of the pedal stroke. The cages also keep your feet from slipping off of the pedals during more aggressive riding. The one-sided design requires you to flip the pedal around with your toe as you get started riding in order to insert your shoes into the clips. You must slide your foot backwards in order to remove it from the clip, which some people find to be a less-than-natural movement. Pros: Inexpensive, work with any kind of shoes, somewhat more efficient than platform pedals. Cons: Can be inconvenient to insert and remove your feet. These pedals have a mechanism that is similar in concept to a ski boot binding. The mechanism holds your foot in place on the pedal during the circular pedaling motion, but is easily released by twisting your heel outward. The term "clipless pedals" is used to distinguish them from pedals with toe clips. Unfortunately, this often causes confusion, because the phrase "clip in" is used to refer to the process of putting your feet in place on your clipless pedals. Clipless pedals hold your foot in place securely, while riding fast on smooth roads, as well as during aggressive riding on off-road trails. They allow you to practice the most efficient pedaling technique, by exerting an even, consistent force throughout the circle of your pedal stroke. The clipless pedal system consists of three parts: the actual pedals, the cycling-specific shoes that are designed to work in conjunction with the pedals, and the cleats, which is the set of hardware that attaches to the shoes that works with the clipless mechanism on the pedals. The cleats usually come as a pair with the pedals, and are also available separately as replacements as they wear out. There are two important characteristics of all clipless pedal systems. The "release angle" determines how far you need to twist your foot in order to disengage the clipless mechanism. Some pedals have adjustable tension, which allows you to customize the release angle and the force needed to get your foot out. For some pedals, you can change the release angle by adjusting the position of the cleats on your shoes. The "float" of a pedal refers to how much your foot is able to freely swivel from side to WITHOUT coming un-clipped. Some people like a lot of float, while other people prefer the secure feeling of no float at all. You can change the float for some pedals by choosing a different version of cleats. Some clipless pedal systems are designed specifically for high-performance riding and racing on paved roads. Road-specific shoes have a very stiff sole that is completely smooth with no tread on the bottom. The cleats are usually a fairly large triangular- or square-shaped object that is held in place on the shoes by three or four bolts. The large cleat helps to spread the force out over a larger area of your foot, which helps to reduce fatigue in your feet during long, fast rides. However, the large cleats and smooth soles do tend it make it somewhat difficult (and sometimes even dangerous) to do much walking around in your cycling shoes when your're not actually riding. Several manufacturers make road-specific clipless pedals. One of the most common is Look, but Shimano also has a few similar models. Both are one-sided designs, which means that the cleat clips into the pedal in only one direction. However, the pedals are usually weighted so that they naturally spin into the optimal position in order for you to get you shoe and cleat clipped in. Another popular brand of road pedal is Speedplay. They have a minimal "lollipop" design that is very lightweight, and also have the benefit of virtually unliimited float. These pedals have cleats that attach to the shoes with two bolts each, and are small enough so that they are recessed into the tread of the shoe. The shoes have rubber or plastic treads that are similar to typical hiking shoes or sneakers. This allows you to walk around much more easily and safely during breaks in your bike ride. This is also useful while riding on rough off-road trails where you might occasionally need to get off and carry your bike through particularly difficult sections. Some mountain bike shoes have soles that are a little less stiff compared to road bike shoes, which also makes them more comfortable for walking. However, mountain bike shoes designed for off-road racing can be just as stiff as some road bike shoes. Because of the walking ease and comfort that they provide, many cyclists who only ride on roads still prefer to use mountain bike shoes and pedals. Most mountain bike pedals have a two-sided design, which makes it quick and convenient to step on the pedal and get clipped in without having to spin it to one side or the other. The most common models of mountain bike pedal are made by Shimano; their cleat system is referred to as SPD. These are the same type of pedals used on the bikes in many indoor spinning classes. There are a few competing mountain bike pedal makers that are gaining in popularity. The Crank Brothers Egg Beaters have a four-sided design, which makes clipping in even easier, and also helps to prevent the pedals from getting clogged up in really muddy off-road conditions. Speedplay makes an off-road pedal called the Frog, which features the same virtually unlimited float of their road pedals. Cons: Cycling-specific shoes required, may not be as efficient as road-specific pedals. You can learn more about Choosing and Using Clipless Pedals in our clinic at all three Century Cycles stores on Tuesday, January 31, 2012. The clinic is FREE and begins at 6:30pm. Our next FREE clinic is Tuesday, December 27, about Dressing for Winter Cycling, also at 6:30pm at all three of our stores. For these and any of our Bicycling and Maintenance Clinics, please call the store you'd like to attend to reserve your place, or RSVP to the Facebook Events. 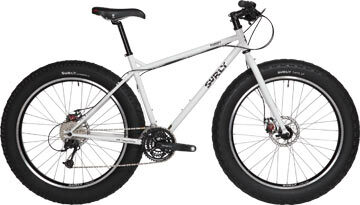 Are you a fan of the Surly Pugsley or any of the other variations of the super-fat-tired snow bikes out there? If so, you know that the wheels on these bikes are specially designed to accommodate the wide tires, plus the offset frame and fork configuration. The wheels come with the bike, of course, but if you're custom-building a snow bike from the frame up, or are just looking for a spare pair, we can handle building them for you. Master mechanic and certified wheel-builder Derrick recently built this set for a customer in our Peninsula store. He used Surly Rolling Darryl rims, Shimano Deore XT Disc hubs, and DT Swiss stainless steel spokes. What's with the holes all the way around the rim, you say? What keeps the inner tube from bursting through? The rims are manufactured with the cut-out sections to save weight. 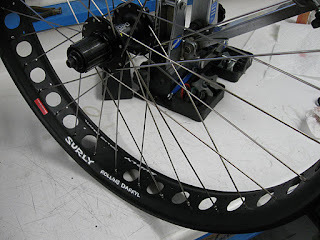 Surly makes extra-wide rim strips to keep your inner tubes in place, plus the extra-low pressure (5-10psi) that snow bike tires typically use don't require a super-stiff rim. 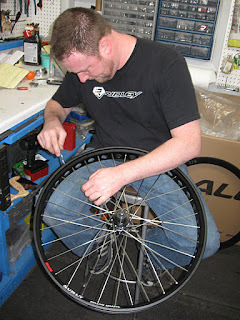 Whether it's for a snow bike, road bike, mountain bike, or anything in-between, if you've got special needs for custom-built bicycle wheels, Century Cycles can handle them. The Blackburn Voyager 3.3 Headlight/Mars 1.0 Taillight Combo is always our most popular Hot Deal ever and is Century Cycles' best-selling light set -- a terrific choice for cyclists of all ages and bikes of all kinds. The headlight sports three super-bright LEDs with flash and steady modes, plus it easily attaches to all handlebars without tools. The Mars 1.0 taillight has four ultra-bright red LEDs with mounts that can attach to your bike, pack or rack. Another option is the Blackburn Flea 2.0 USB Headlight - available in bright blue or hot pink for a colorful and super-bright addition to your handlebars! This little powerhouse is featherweight yet boasts 4 ultra-bright white LEDs. This Hot Deal is good only December 15 - 28, 2011, while supplies last. In-store purchase only; no online or phone orders accepted. No coupon necessary. Just in time for last-minute holiday shopping, the January/February Bicycling magazine on newsstands now spotlights the best new $2000 road bikes that give you lots of speed at friendly prices. They say, "More affordable than top-level race bikes, yet still fast, fun, and ready for your next ride, one of these machines could make your dreams a reality." Of the five bikes profiled, two are in stock at Century Cycles! About the Giant Defy Composite 1 ($2,399.99), test mechanic Michael Yozell writes, “Intended to handle whatever the road throws at you…the Defy’s ride is a fine mix of a race bike’s rigid chatter and an overly plush sensation…you’ll be able to ride fast and still take in the scenery.” He more cleverly found this great feature: “…we applaud Giant for equipping this quick, comfortable bike with its P-SL-1 tubeless-compatible wheels…This is the first bike at this price point to deliver tubeless technology in a ready-to-ride package, and we’re excited that recreational riders can take advantage.” This is the bike for you if: “you want Classics-inspired handling and an upright position." 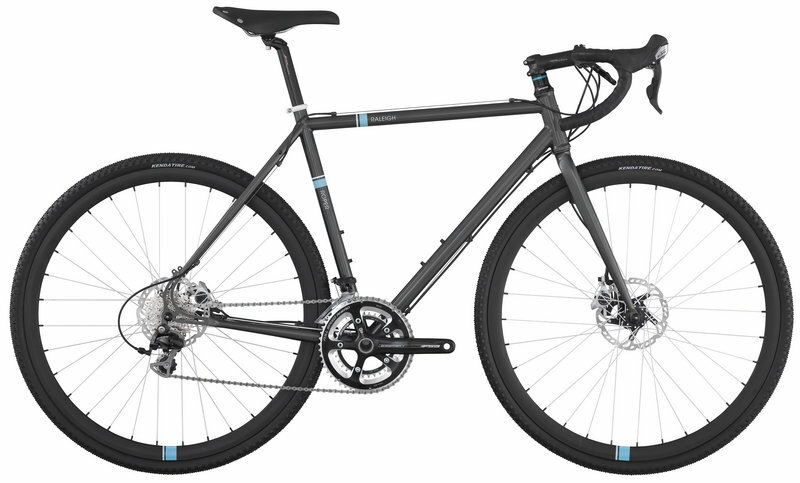 About the Raleigh Revenio Carbon 1 ($1,999.99), they write, "It's a bike that's comfortable for any recreational rider. Emplying flattened seatstays, it handles rough surfaces with ease, effectively muting larger jolts. The steering is neutral, without sluggish turn-in....the Revenio delivers everything the recreational rider needs.... Buy it if: You want a bike to comfortably cruise on. Forget it if: You like a stretched-out or rear-biased position." 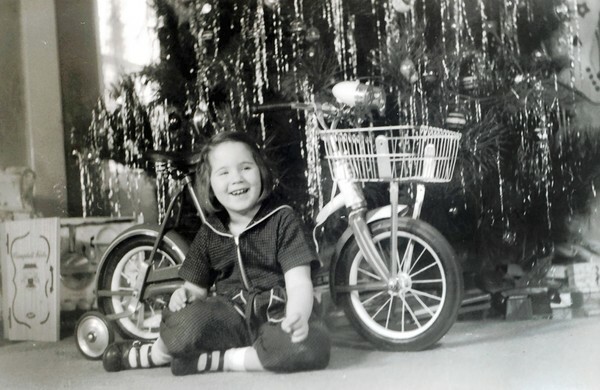 What cycling gifts do you hope Santa leaves for YOU under the tree this year? Click here to take our quick online poll (which may or may not be a hotline to the North Pole -- we're not allowed to say). This video will inspire bicyclists of all ages! Be the best Santa ever and put a Raleigh Push (now 10% off!) under the tree for your little one -- mad mountain bike skillz just may follow, but at the very least, he or she will be introduced to the wonderful world of bicycling in a fun and easy way! The Century Cycles store in Peninsula enjoyed the sunny winter Saturday by participating in the festivities of Christmas in Peninsula! Visitors to the village strolled the streets to see all of their favorite holiday characters, enjoy some snacks, and maybe even play Santa themselves by catching up on their gift shopping! Can you identify who's playing the part of the high-wheeling elf? Santa's little helper can handle a two-wheeler pretty well, but where does he carry the bag of goodies? Century Cycles is your holiday headquarters -- we've got the stores decorated with "Define your life. Ride a bike." ornaments (above! ), our Holiday Sale is going on now through December 31, and Santa is riding a bike in our display at Holiday Lights at the Medina Fairgrounds! Long the first name when it comes to helmets, Giro is now making a name for itself with top quality cycling shoes that really impress us -- so much so that a full selection of men's and women's models is on the way to Century Cycles stores in the weeks to come. The first model to arrive in stock is the Giro Privateer ($149.99) men's mountain bike shoes. The word in the bike press is that Giro's senior shoe designers worked on it to maintain performance while keeping the price reasonable. Featuring two velcro straps and one adjustable ratcheting buckle, these shoes offer the comfort and support to take your rides to the next level. Also nice? They are available in a normal fit and what Giro refers to as HV, for wider feet or for folks who simply like a bit more room. Stop in to try on the Privateer, and stay tuned for more models arriving soon! If you've shopped for a bike recently, or even if you're an experienced rider who's ever shopped for new tires or inner tubes, you've come up against the confusing arrary of sizes available. What do all those numbers mean? And why have so many choices in the first place? Why don't they come up with a standard? As they say in the computer industry, the great thing about standards is that there are so many to pick from. It may sound surprising to you that there actually used to be many times more varieties of tire than are common today. In the early years from the invention of the bicycle through the early 1900's, many bike manufacturers had their own set of sizing standards that only applied to their own bikes. It is a testament to how far we've come that today you can buy tires, tubes, and wheels from three different manufacturers and be sure that they will all work fine together, as long as you select the proper sizes of each. Most mountain bike have 26-inch tires, as well as most modern beach cruiser-type bikes, and comfort hybrid bikes. The first mountain bikes were adapted from beach cruisers, which used 26-inch tires, so that's how it became the de facto standard for mountain bikes. Some time after the mini-boom of 29er mountain bikes occured, there were some people in the bike world who felt that the larger 29er wheel had some disadvantages. Whether these disadvantages are real or perceived is a matter of differing opinions, but regardless, detractors of the 29er felt that a "happy medium" tire size between 26 and 29 was needed to provide "the best of both worlds." They looked back in time to the 650B wheel size, which was somewhat prevalent on touring bikes some years ago. 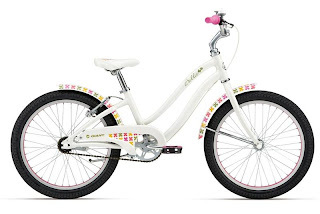 Some big-box stores also sell kid's bikes in 14-inch ans 18-inch wheel sizes, although these are much less common. We usually have replacement tires and inner tubes in stock for all sizes of kid's bikes, including 14-inch and 18-inch. The advantage of this is that there are now fewer road bike tire sizes to keep track of. The downside of the current standard is that there is no consistency in the outer diameter of tires. 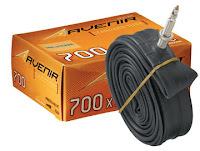 700C is used to refer to any tire, rim, or wheel with a 622mm BSD, but it could be on a skinny-tired road bike where the wheel has an actual diameter is only 660mm (which is actually a little LESS than 26 inches! ), or a mountain bike with a wheel diameter of over 29 inches. Half-off prices valid Dec. 1 - 14, 2011 only. Hot Deal #3 is a road biker's dream! Get 50% off on one of the most popular and winning helmets on the road circuit AND 50% off a terrific high-speed wheel set that is ideal for crits, road races, or those long training rides in the Ohio countryside. A favorite of pros and racers (both road and off-road), the Bell Sweep is a strong yet svelte helmet, with a feathery curb weight of just 10.5 ounces and 20 functional vents that channel airflow over the head. Other top-level features include Bell's Twin Axis Gear system (see video below) for an awesome fit and feel at any speed. Available in Matte Black/Carbon, with a removable VPV visor. Weighing in at just 1640 grams, the A23 is Velocity's newest road wheel set and it comes in black/black/black: 700c black rims with machined brake surfaces, black spokes, and black high-precision-sealed cartridge-bearing hubs. The newly-designed proprietary hubs have offset flanges for precise tension - making for wheels that are stronger, stiffer, and better optimize power transfer. Using a 23mm wide tire with the A23, you'll have increased cornering abilities - especially at high speeds - without sacrificing rolling efficiency. Compatible with Shimano and SRAM cassettes. This Hot Deal is good only December 1 - 14, 2011, while supplies last. In-store purchase only; no online or phone orders accepted. No coupon necessary. Santa has embraced Century Cycles' motto "Define your life. Ride a bike." by replacing his reindeer with bicycles for Christmas this year and becoming the North Pole's busiest bike commuter. Well, at least the Santa in Century Cycles' display at Holiday Lights in Medina is going by bike! Holiday Lights is open now through December 25 (6-10pm on Fridays and Saturdays; 6-9pm on Sundays, and 6-10pm the week before Christmas). Cars are $7, 15-passenger vans are $12, and a bus is $50. The Medina County Fairgrounds is located at 710 Smith Road in Medina. For more details, go to http://www.medina-fair.com/.